Many moons ago, when Chef Savla and I were dating, he took me for my first Korean BBQ. I’d assumed – and it’s not exactly a wild assumption – that the meat would’ve been barbecued in the kitchen then served. 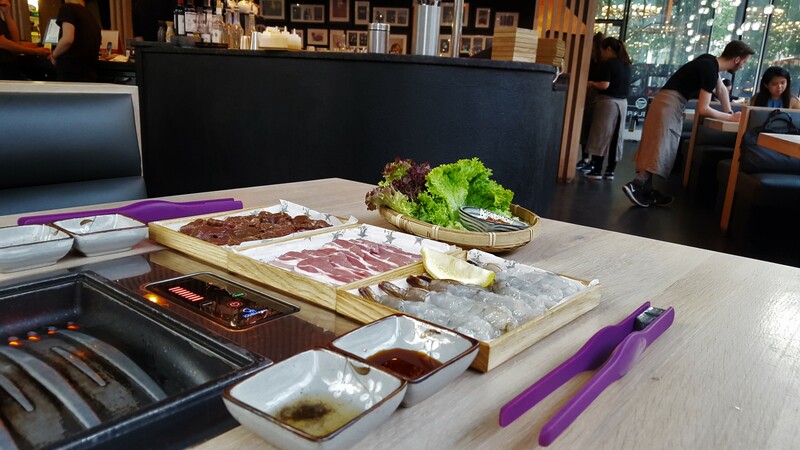 Instead, out came trays of thinly sliced raw meat for us to cook at the table. 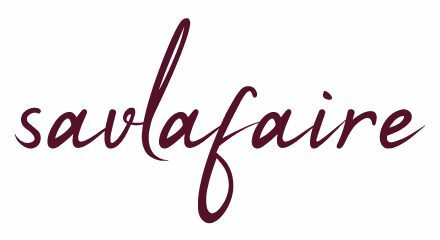 Of course Chef Savla had known what to expect, but kept schtum for his own amusement. 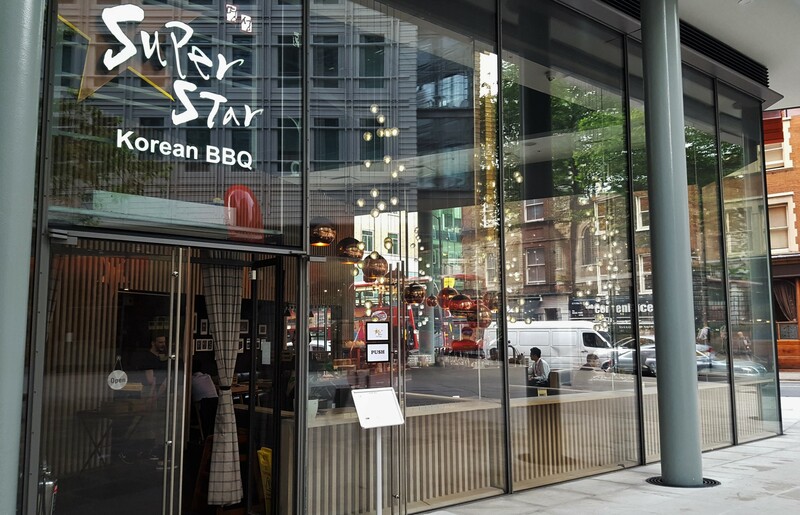 Anyway, while it wasn’t exactly the stuff of romantic dreams, it was a novelty experience, so when I was invited to try the SuperStar BBQ (SSBBQ) in Soho, which opened in July 2015, I didn’t shun the idea. However, given that cooking isn’t my forte, I made sure Chef Savla was my plus one. 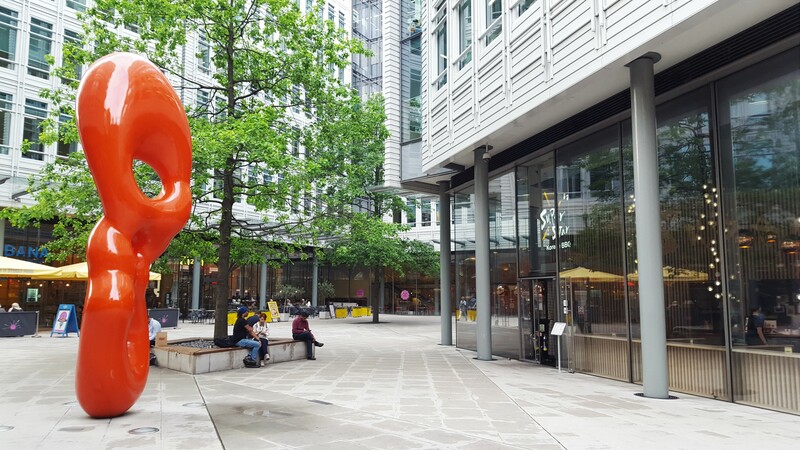 Ambience and decor: Tottenham Court Road station/Central St Giles has become a temporary maze ahead of the Crossrail launch in 2017. It therefore took me some time to find the restaurant, but quick tip: if you look for a tall, red statue, you can’t miss it. The glass-fronted SSBBQ is modern on the outside and inside, with 4-seater leather-covered booths lining one half of the space and tables along the other. I particularly liked the coppery globular lamps, reminiscent of hood dryers in hair salons. 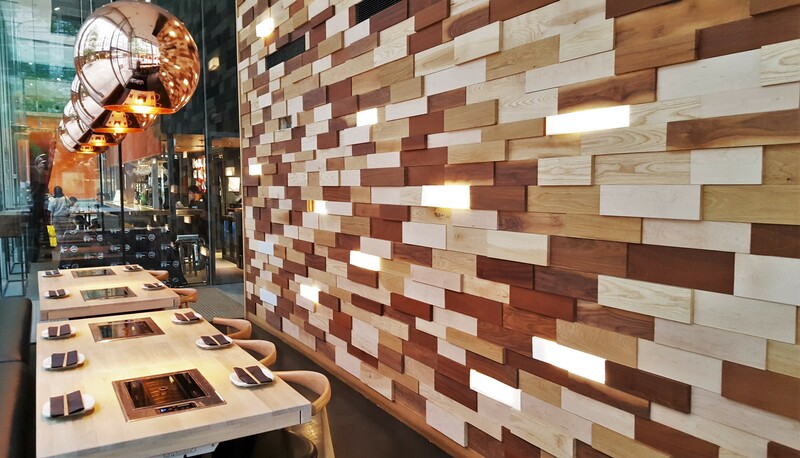 Continuing the contemporary theme, one of the inner walls looks like a giant horizontal Jenga. 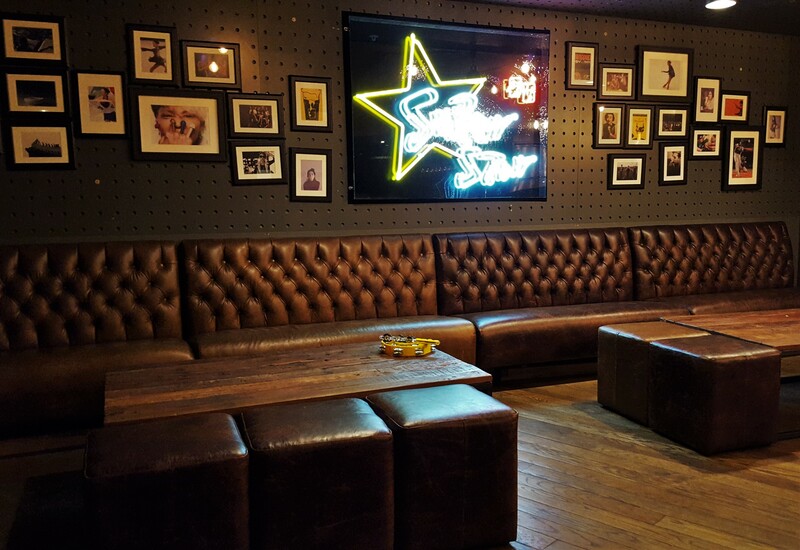 Then there’s a karaoke bar downstairs, where you can belt out Korean, Chinese and Vietnamese tunes, and the odd English song, to your heart’s content (discounted rates for diners). Service: Our waiter that evening was Kieran, who was the right mix of friendly, knowledgeable and funny. He ran us though the concept, clarified our queries then advised us based on likes and dislikes. The pace of the meal was perfect until we got to dessert, when we had to ask for the menus then attract attention to order the dish. By this point, the restaurant had filled up, so Kieran had moved onto another section. 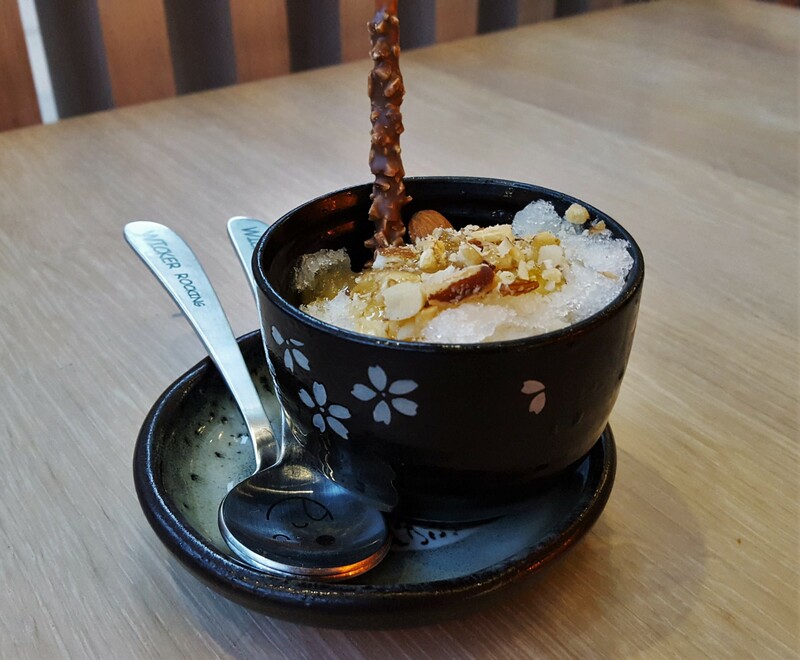 Food and drink: As tempting as it was to order one of everything, we reined ourselves in and had a selection of small plates, a few items for the BBQ, bibimbap and dessert. Drinks were a soju and Prosecco-based Queen’s Peach and a Kojito, or Korean-style mojito; refreshing and light. 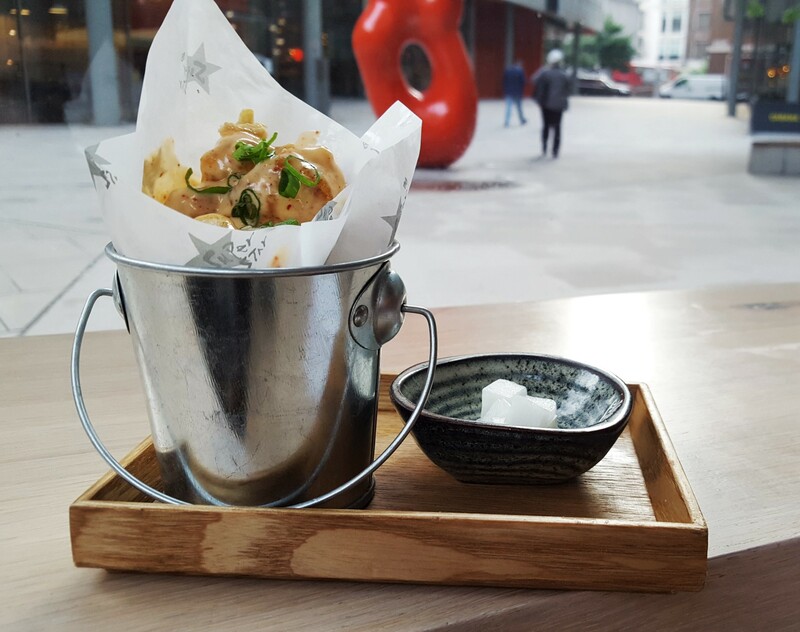 Starters were kimchi (fermented cabbage), KFC (Korean-Fried Chicken) and beef tartare. 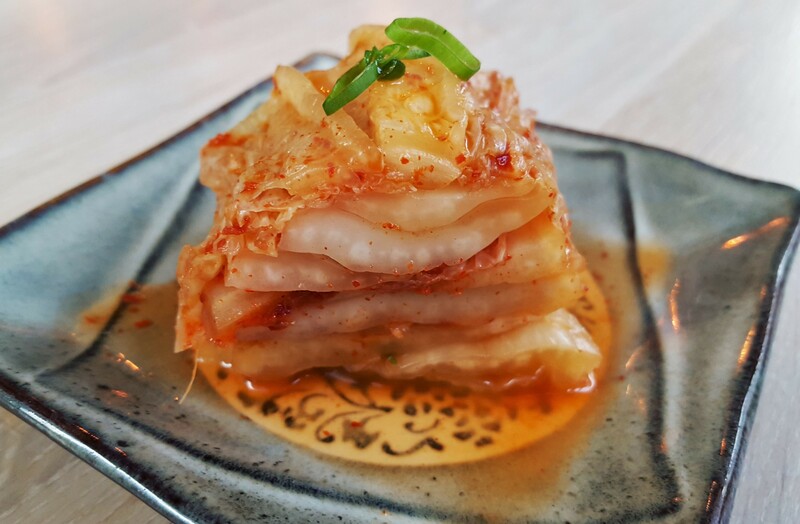 The kimchi, the popularity of which shows no signs of waning, was stacked in alternating soft and slightly crunchy layers and had a hint of garlic and chilli, although we would’ve preferred it to be a touch stronger. Similarly, fried chicken is firmly on the map these days, and for good reason. SSBBQ’s version is crisp and grease-free, but was sadly drenched in spicy mayo. As tasty as it was, I wish it’d been served as a dipping sauce. 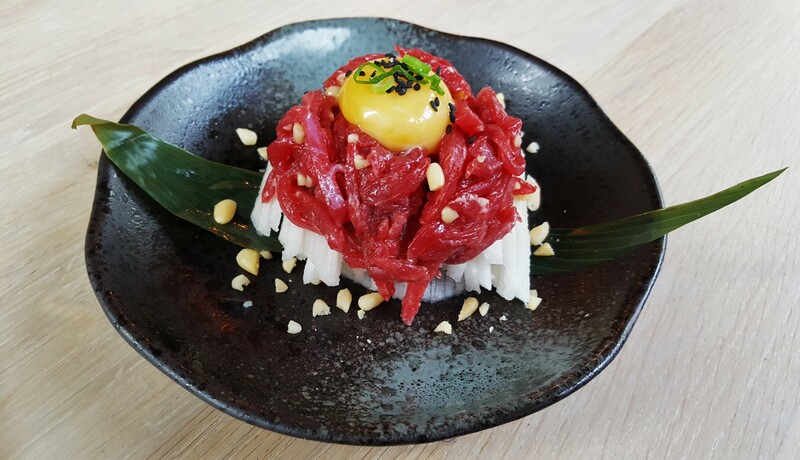 Then the tartare: if it’s on the menu, I’m having it, as evidenced on my visits to Bellanger, Drapers’ Arms and Duck & Waffle earlier this year. 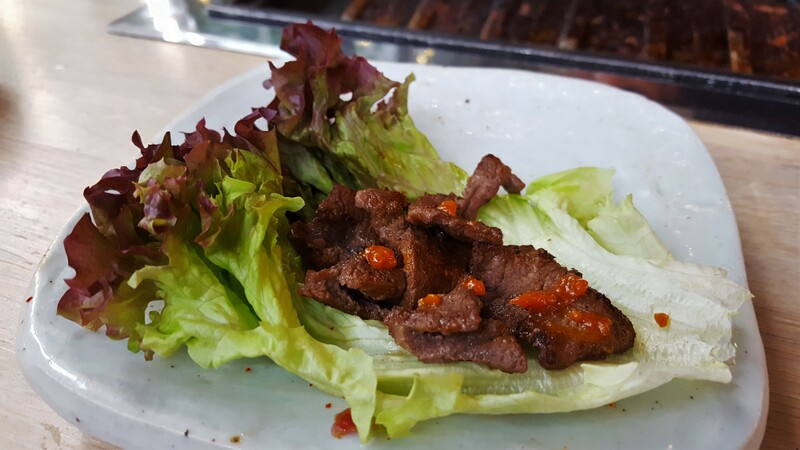 The tiny strips of beef sat on julienned Korean pear, which was more delicate and sweeter than store-bought ones. The sweetness contrasted with the rich egg yolk and crushed pine nuts, and there was a back note of sesame from the toasted oil dressing. Had it not been for the odd frozen strip of meat, this colourful plate would’ve scored full marks; such a shame as once they’d come up to room temperature, the ingredients were perfect match. Empty plates cleared, Kieran switched on the BBQ and we got cooking. To avoid imparting their flavours, the most marinated meat is kept till the end and so we had juicy king prawns followed by wine belly pork then beef (rib eye). 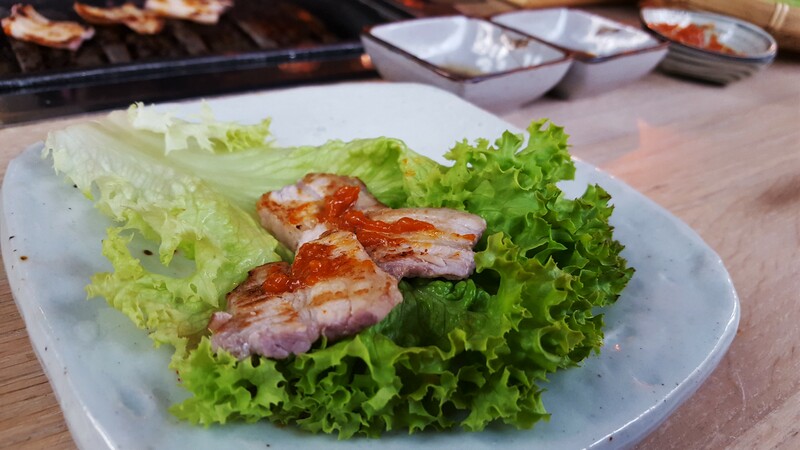 A few pieces of fish or meat are then laid on a lettuce leaf, dotted with miso paste, wrapped tightly and dipped in soy sauce. Victory belonged to the beef that evening for its mellow yet memorable marinade. The lettuce leaf wraps being light, we still had room for one more main. 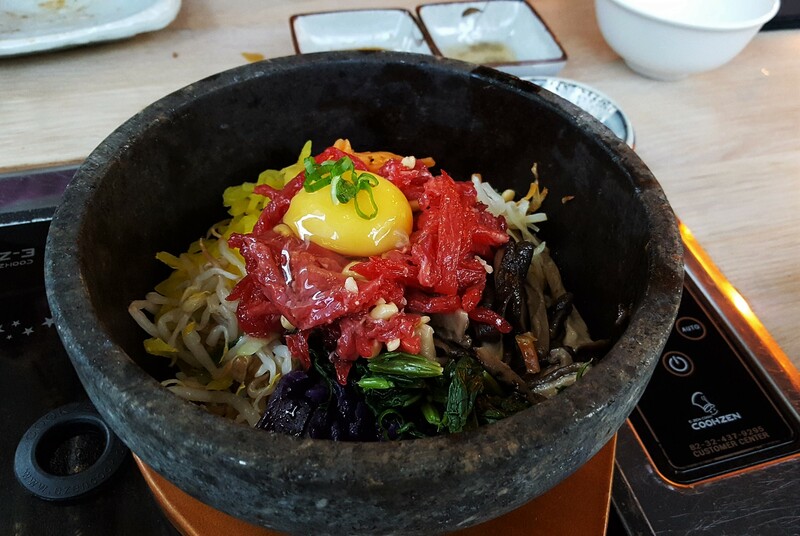 Combining rice, veg and meat, a bibimbap is basically a one-stop shop in a searingly hot stone bowl. We loved the fresh piles of red cabbage, beansprouts, shitake mushrooms, spinach, carrots and beef, which were quickly stirred around at the table to prevent it from sticking to the sides. It’s a fun, healthy and delicious dish that ticks off the main food groups, served with Gochujang, a garlic-laced savoury/spicy Korean condiment. All this effort required a reward, so our thoughts turned to dessert. Since some were unavailable, it had to be the honey and quince snow ball. Not being a sorbet fan, I didn’t have high expectations of “shaved ice”, but was surprised by the sweet-cool-crunchy-chocolately combo. Verdict: This addition to the Soho scenes strikes a few high notes, but watch out for some false ones along the way. Hopefully they’ll be rectified soon because the restaurant has potential, especially given its prime location and dual purpose. However, costs can easily rack up and aren’t fully justified for the quality of the food in my opinion, especially since you cook some of it yourself. It’s not particularly elaborate, but the flavours are there and some finesse will go a long way.